This travel size kit is designed for those unpleasant moments when you stain your fur. 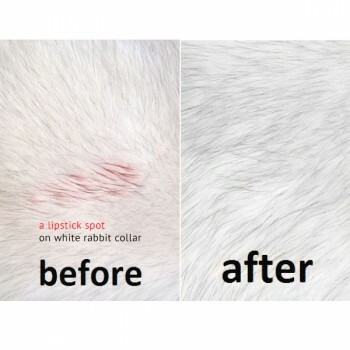 Clean makeup, lipstick, food, and fat stains from your fur garments quickly, safely and easily when you need it most. For best results apply within 24 hours of stain occurrence. Our tough stain removal solution works on old stains as well. No one will care for your fur as carefully and promptly as you. My daughter spilled Coke on my grandmother custom mink stole. That was 2 years ago, she promised to have it professionally cleaned. She is getting married next week and I wanted to get some pictures of her wearing the mink with her wedding dress. When she pulled it out of the closet, it still had the soda on it, she never took it to the furrier to be cleaned! It was too late to get it back before the wedding. I was desperate and took a chance on Lana's cleaner. Even though the stain was 2 years old, Lana's kit got most of the Coke out. It's not perfect, but it didn't hurt the mink and it's not obviously sticky. I don't feel this product is a substitute for professional cleaning but it sure helps in an emergency. Or if you're just wanting to spruce up an old coat to sell. I would definitely use this product again if necessary. For complete directions please click here to follow our easy steps for fabulous results. qI am interested in trying your product but nowhere is there any mention of cleaning the lining. What do I do about this? The best way to clean a coat's lining is to take it off gently and clean separately, the same way you clean a textile, i.e. in washing machine or using dry cleaning service.